The most complicated question every entrepreneur who is going to start an eCommerce website is that which eCommerce platform should he/she should choose. In this article, we are comparing MagePlus and OpenCart. 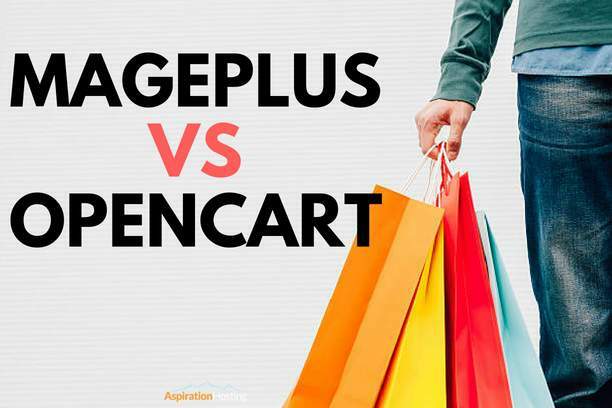 Read this article and you will be able to decide which one is best – MagePlus or OpenCart. MagePlus is a fully hosted Magento based eCommerce platform. So with MagePlus, you don’t have to look for any other hosting provider. But with OpenCart, you have to find a good hosting provider. Also, if the hosting is very poor, then it will affect the performance of your store. When you opt for MagePlus, your website is hosted on super fast servers of Aspiration Hosting. Therefore, you can ensure high-speed page load with MagePlus. There are numerous themes available in the Magento store, which will help you to customize your store as you like. With MagePlus, you can build the site of your dreams. OpenCart is also an open source solution like Magento. But OpenCart is limited in extensions and themes. When it comes to SEO, MagePlus is far ahead of OpenCart. According to eCommerce platforms, Magento is the best SEO friendly eCommerce platform. OpenCart offers only the basic SEO features like adding titles, meta tags etc.. But MagePlus is more robust. With extensions available in the Magento store, you will get endless possibilities to make your store SEO friendly. Pricing of MagePlus depends on what type of business you are running. The basic package of MagePlus will start at $29.9 per month. Established eCommerce businesses can use MagePlus $79.99 per-month standard plan. The standard plan is coming up with Aspiration CDN. Businesses trying to scale their eCommerce store can utilize MagePlus $299.99 per-month advanced plan. The advanced plan has more resource limit to suit your business scaling. Even though OpenCart is free, you have to find a quality hosting provider. You have to pay for additional services like SSL certificates. Also, if you are not a tech savvy person, then you have to get the help of someone to install and configure OpenCart for you. But with MagePlus, we will install and configure your website in just one day so that you can start the business as soon as possible. Therefore, select MagePlus to get endless possibilities of a Magento store at an affordable rate.